Thanks to all my friends and viewers. 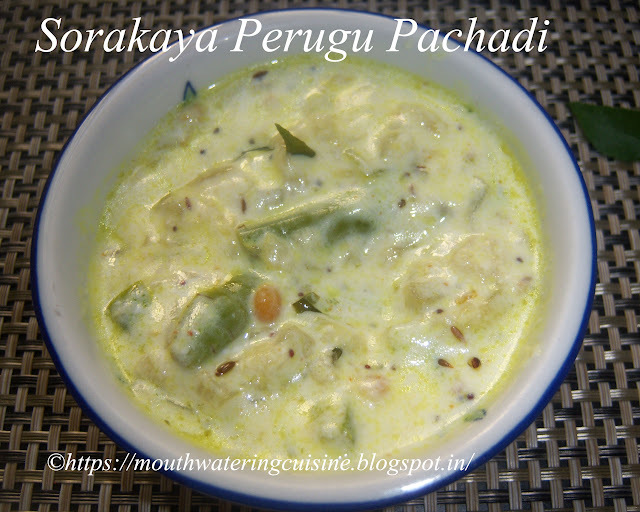 Today I will write how to make sorakaya perugu pachadi. Sorakaya is bottle gourd english and lauki in hindi. Sorakaya perugu pachadi can be served with rice or roti. We use fresh and tender sorakaya for making this dish. Fresh curd used in this dish gives nice taste to it. The vegetable itself is mild and adding curd to it gives subtle taste to it. Wash and peel the skin of sorakaya and chop it into small pieces. Slit green chillies and keep them also aside. Heat oil in a kadai, add mustard seeds, cumin seeds and red chillies. When they start spluttering add slit green chillies, curry leaves and coriander leaves. Fry them for a minute and then add washed vegetable pieces. Add asafoetida and salt,turmeric powder to it. Cook them on the low flame. If necessary add little water. Cook till the sorakaya cooks completely and becomes soft. Allow this to cool completley for some time. Lastly add curd to it and mix well. Serve sorakaya perugu pachadi with rice or roti. 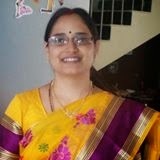 For more curries click here.Thank you for visiting my blog. Hope you liked all my recipes. Any feedback and comments are appreciated.